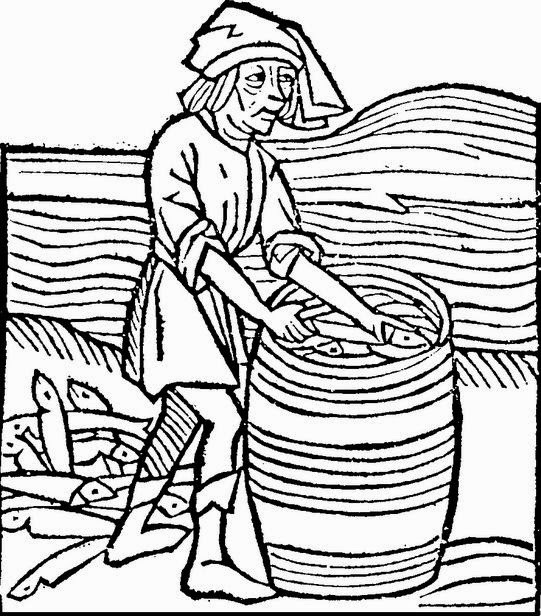 Medieval Morsels: Herring in disguise -kipper or bloater? I had a lovely lightly cured kipper or was it a bloater for breakfast (or was it lunch?) the other day. The last time some wonderful freshly preserved fish like this came into the house they were eaten before I got around to photographing them. Not so this time! And here they are - handsome fellas artistically posed with some red pears which set them off rather attractively don't you agree? My partner often does some food shopping so surprises abound! And the connections I can with medieval eating practices seem endless, giving me food for thought, and blogging material! Can there ever be such a thing as a fresh kipper? 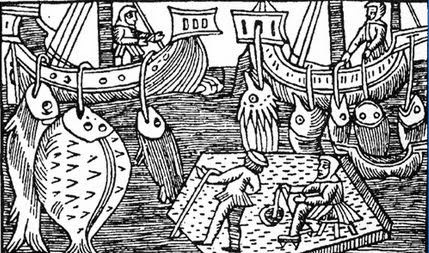 Lets consider a Dark Ages or Middle Ages (Medieval) fisherman, or indeed a Renaissance times "trawler of the sea". In northern Europe herring was a popular, cheap and plentiful fish caught from earliest times - there is evidence it was fished before 1000 AD!! That's over one thousand years pursuing this versatile fish. But herring is an oily fish and goes bad very quickly, so immediate steps had to be taken to preserve it for transport to market. The processing on board ship involved gutting, flattening, salting and packing the fish into barrels. A very smelly and messy business I have no doubt. 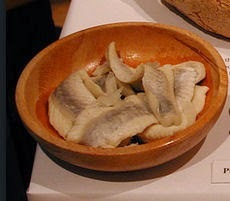 Peasants living close to North Sea ports in Europe, or even in medieval London, would have easy access to brined "white" herring. It was a relatively cheap "staple" food. It offered a "fresher" and welcome alternative to the even saltier, often many-years-old, "stockfish" (salted cod). This dried fish by con trast needed the equivalent of a medieval mallet as well as long soaking (often in unclean water) to render it edible! Its fitting that the herring was in fact MedievalMorsel's first 12th scale dollshouse miniature food to be listed in my Etsy online shop. My maternal grandfather was a Suffolk-based drifter-man away for long periods at sea chasing herring in the early 1900's. And I grew up in King's Lynn, Norfolk an important Hanseatic League port for medieval merchants trading in barrels of herring and other produce from and via the North Sea!